Got an air conditioner Freon leak? 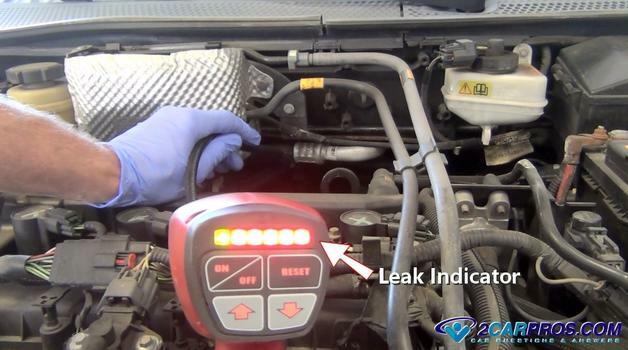 If you have too continuously recharging the system or if the system is flat you have a leak which needs to be detected. 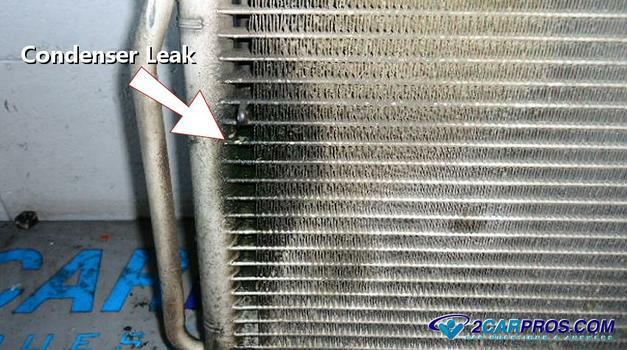 This guide will show you how to find a refrigerant leak. There are a few ways to find a leak which depends on how big the leak is. 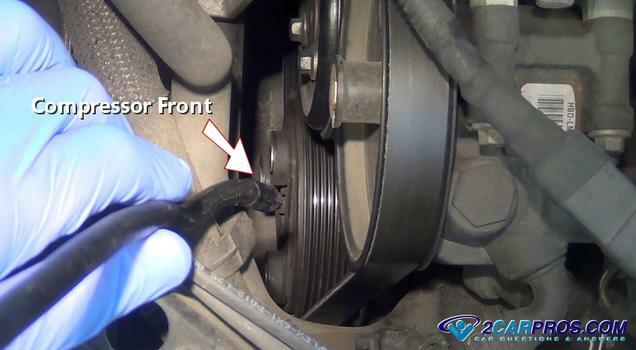 If the leak is relatively quick you should be able to hear it leaking much like a hole in a tire which is easily found. 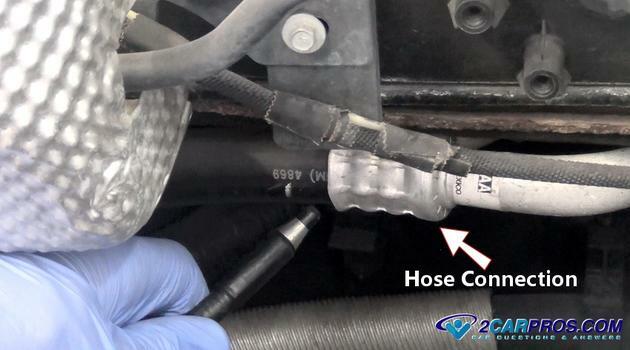 Large leaks are typically a blown hose or a line that has been rubbed through on the frame or bracket in the engine compartment. Here is a video that will give you an idea on what you are in for when checking for leaks. Once you are done watching the video continue down through the guide which will give you additional tips and information which is updated regularly. 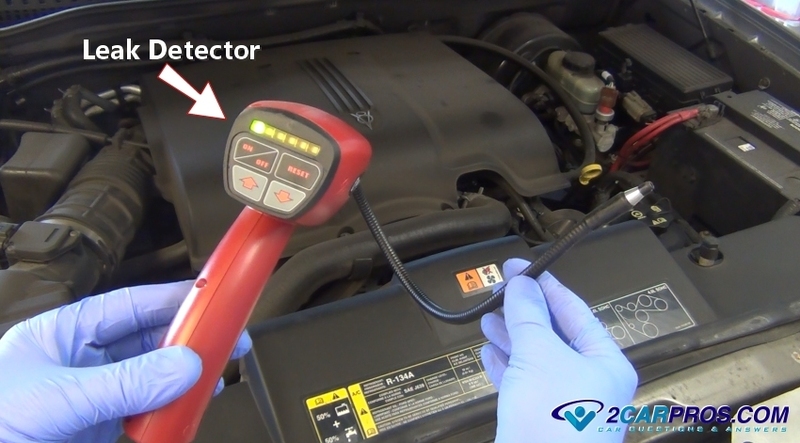 There is an alternative way to find leaks not involving a leak detector. With the a/c system fully charged prepare a water spray bottle with a heavy soap solution. 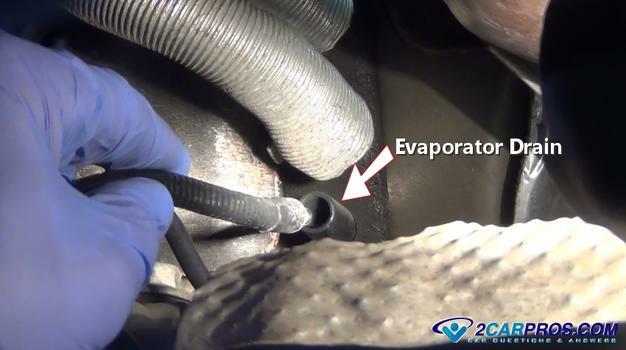 Then spray around the various components and when a leak is found bubbles will start to appear indicating a leak. 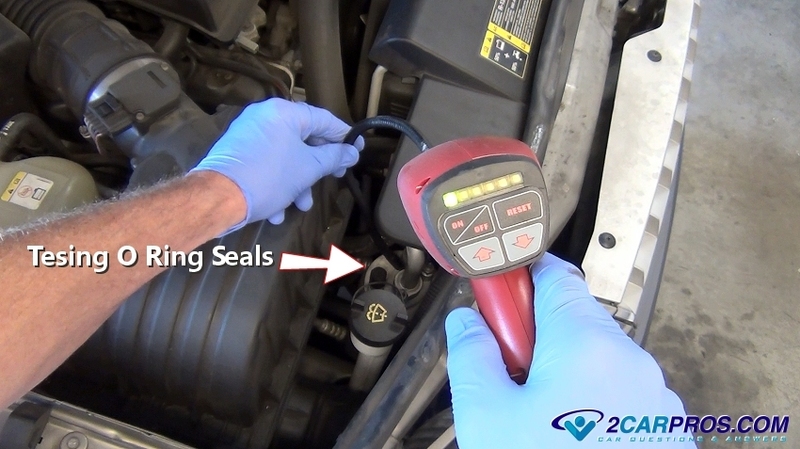 This method works well except for compressor front seal and evaporator leak detection. Also, there are some Freon products that include a dye which when installed into the system will be detected using a black light but again a compressor front seal and evaporator leak is difficult to detect. The method below is preferred way to find a leak. If you cannot hear the leak or find any oil residue then a detector is needed. If you do not have a detector you can purchase one from Amazon from about $35.00. The detector is comprised of a main body which holds the sensing device, batteries, on and off switch and sensitivity controls. This is what they typically look like in the image below. 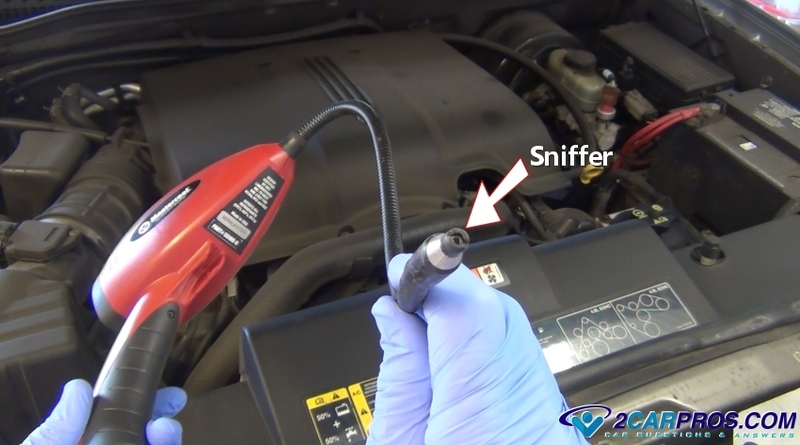 At the end of the detector is the "sniffer" which is where the detector pulls a small amount of air to be analyzed for traces of refrigerant when turned on. Before you begin testing the system should be full of Freon so the detector can do its job. If the system is flat or very low there will be nothing for the detector to sniff for. Also, the engine must be off and the car must be in a place where there is no wind or breeze. Any air movement can push the Freon away from the actual leak and give you a false reading or make the detection more difficult. One more thing worth mentioning is that refrigerant is heavier than air so try to test below or at the bottom of an object for leaks. Dust and dirt can cause the detector to falsely "go off" and it can fool you into thinking there is a leak when in reality there is not. If you do accidently catch some dust blow into the sniffer tip and the detector will reset itself. Keep the tip out of the dirt of the vehicle as much as possible. Turn the detector on and adjust the sensitivity to the lowest setting to start testing. Here we are testing an O ring seal on the receiver dryer with no response from the detector. O rings are popular places to finds leaks. The tester will indicate a leak by showing one or more red lights while beeping. If you have tested the entire system and no leaks are found adjust the sensitivity to its higher setting. 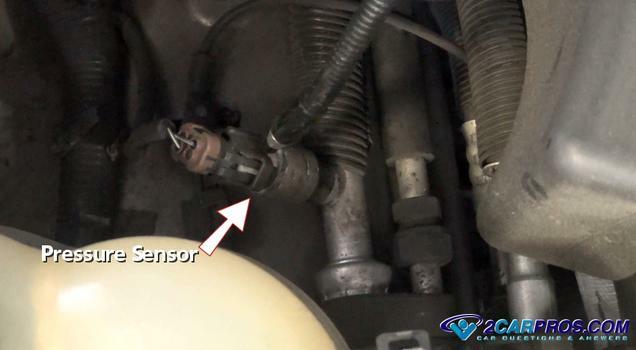 The pressure sensor for the system also presents a popular place to find leaks check at the base and at the electrical connector. The condenser which is positioned in the front of the vehicle is subject to small rocks and other road debris which can easily get damaged and will leak. Check the entire condenser including the hose connections. The front of the compressor is where the main shaft seal is located and a very popular place for Freon to leak. You want to position the sniffer in the very front of the compressor and at the lower part of the clutch. Again try not to get dirt into the nose of the sniffer. Hose fittings of the system look like this which is an inverted hose barb that holds the rubber hose to the aluminum fitting or tube. Test at the lower part of the connection. Here is a method to check the evaporator of the system. Locate the water drain and insert the sniffer, if a leak is detected the evaporator core or the O rings that seal it to the high and low side hoses are leaking. 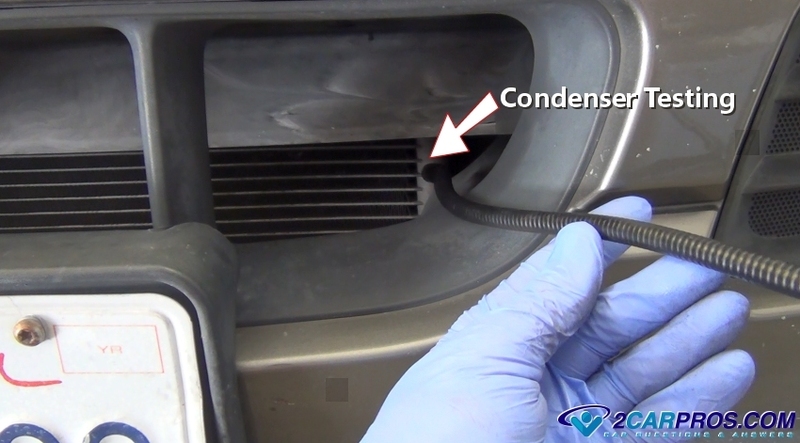 This drain allows the condensation water that drips from the evaporator when in operation and channels it away from the cars interior. Do not get water into the nose of the sniffer. Have you ever seen regular water under the car when the air conditioner is running or has been running? This is where it drains out from. Also, when regular water is present inside the car on the passenger side when the air conditioner is in use this tube is plugged not allowing the water to exit. Use compressed air and blow into this drain to fix the problem are you can use a wire and insert it into the drain to relieve any blockage. When the detector has found a leak it will indicate this by beeping rapidly and advancing the red lights on the detector. The system must now be discharged and the line removed and replaced. Once the repair is completed the system must be vacuumed down and recharged. If you have any questions you would like to ask please do so, our community of mechanics is happy to help.